Info Fill the container with coffee beans! Don't worry about dropping a few. Daily Grind is one of Jimmy T.'s microgames in WarioWare: Twisted! The game's objective is to fill a coffee container with at least ten coffee beans. 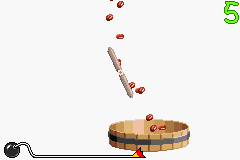 To do so, the player has to rotate the board at the right timing to make the beans fall inside the container. If done so, the game is won. However, if the time runs out and the container has less then ten beans, they lose. 1st level difficulty: The container is a big barrel. 2nd level difficulty: The container is a small barrel. 3rd level difficulty: The container is a small vase. This page was last edited on September 27, 2018, at 18:47.